I have a premiere for you today as well. 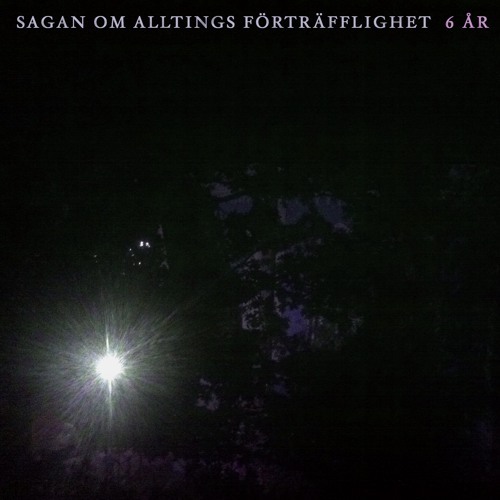 The producer and songwriter Joakim Persson has created the project Sagan om Alltings Förträfflighet and is releasing the 18 minute long piece “6 år” today. If you follow this blog you have heard Joakim before in the bands Tiny Union and Century Of Ecstasy, but this is something completely different, and I recommend you to read the background story below before you listen. “I was tired of everything and I decided to give myself 6 years to sort out my life and my feelings. During that time I scribbled down cryptic fragments of texts in my notebook. The music is an interpretation of the various phases of depression and in the end the idea of the 6 year period gets a bit blurred, and you can sense that the mist finally disperse and disappears. This is hardly some easy listening, but a fascinating and naked characterization of something hard and difficult in the lives of many people. Earlier this year Joakim released a debut album under the same project name, with songs of a totally different character, and next year he’s planning to release an electronic pop album, he says. Burlin is a rare bird in hip hop, I’d say. It’s the poet who’s chosen hip hop to carry his lyrics rather than the hip hop artist that’s become a poet. This is empasized even further in the poetry readings in between the songs, as poetic comments to the sharp, hard song lyrics, which shows us seriousness as well as gallows humour. Stefan Källström (Dirty Cannibal Peasants) has created the music and Burlin’s father, Christer (sr) Burlin excels in the dramatic readings (all in Swedish I’m afraid). The EP, with it’s 10 tracks is available on Spotify. You can find Burlin on his site.